Giant Box of Comics: The Infinte Road to "Secret Wars"
The Infinte Road to "Secret Wars"
I feel like this is a bit of a cop-out post, since there are sooooo many reading order lists for the "Infinity" event. Also, because there's actually an official reading order at the back of all of the comics, at least for the two Avengers series and the main Infinity series. 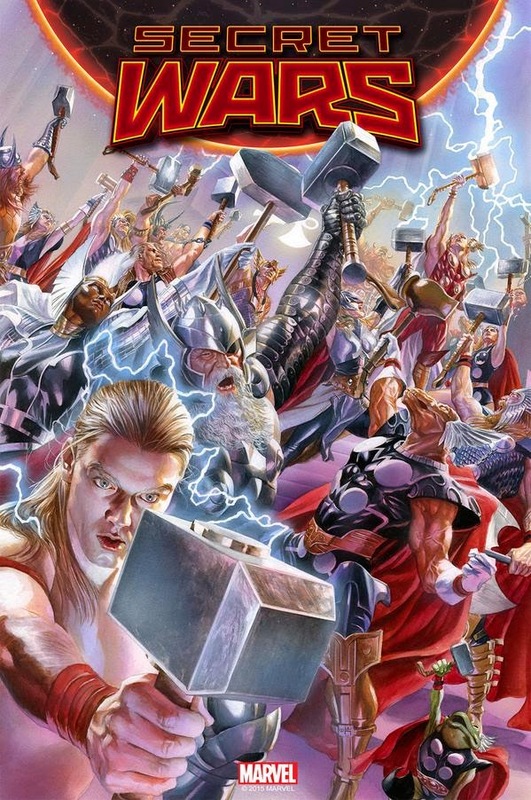 So instead of doing a similar post as the last two "Secret Wars" posts, I'm just going to list the reading order, and do a general musing on the event. Infinity #1, Avengers #18, New Avengers #9, Infinity #2, Avengers #19, New Avengers #10, Infinity #3, Avengers #20, Infinity #4, Avengers #21, New Avengers #11, Infinity #5, Avengers #22-23, Infinity #6, New Avengers #12. Overall, I enjoyed the crap out of Infinity. It puts a nice cap on the Builders story that Hickman has introduced throughout his run, it shows us how the Illuminati deal with a major crisis even as they're dealing with a MAJOR major crisis, and it puts the Avengers into the kind of cosmic struggle that previously only a team like the JLA might have handled. I've said it before, and I'll repeat it now: the Avengers are the Marvel equivalent of the JLA, and should absolutely be treated as such. I think Bendis did a nice job of balancing the cosmic Avengers stories in the main title with more down-to-Earth stories in New Avengers, but Hickman has thrown that out, and put the Avengers, new, old, or illuminated, on the cosmic playing field. Where, IMHO, they belong. This is a war story. We see Captain America really (really!) shine here, which nicely reminds us that he was, in the Marvel U, a lynch pin in World War II. As we are told in the film, the super soldier serum doesn't just enhance physical attributes, but mental ones as well. Cap is the ultimate strategist. Which, I suppose, could forgive my one little quibble with this story: its humano-centrism. I know this is a symptom of us reading stories about beings ostensibly the same as ourselves. It would be difficult to enjoy the story quite as much if the Avengers were simply cannon fodder, and the Shi'ar or Skrull were the focal characters. But this privileging of humanity as somehow much more capable and magnificent than any other species in the galaxy is stretching things a bit. If you have to ask the question "Where would everyone in the galaxy be without the inhabitants of Earth? ", you're giving us, and our superheroic counterparts, way too much credit. But that's a minor quibble, because, like all of you, I like to feel special too! The Earth-bound part of this story I enjoyed slightly less. I'm not sure of why Thanos is doing what he's doing, and the inclusion of the Earth invasion really just seems to be a set-up for the "Inhumanity" event and to place Thanos and his lieutenants on Earth in order that they eventually join the Cabal. But I feel like that could have been incorporated somehow into the main Builder storyline more fluidly. That whole writer versus editor thing comes to mind here. So, that's Infinity. From here on out, things get crazy. Crazier?